The Importance Of Feeling The Seasons. Most people are not even conscious of how the seasons affect us. If they are, their awareness usually goes only as far as a vague attempt to eat seasonally, if that, but even the full reasons for this are not understood. In the end most people just take notice of the daft government guidelines to eat their “five a day”, which has them munching on sugary imported fruit in the northern hemisphere in the winter, under artificial light, believing it’s healthy and wondering why they are still diabetic… or at least chubby and plagued with colds or SAD (seasonal affective disorder). Okay, it’s a start to eat locally produced food – it’s fresher, it makes more economic sense and it supports local growers and farmers. But there are so many more reasons. For millions of years before foods could be imported, we lived in tune with our environment, and barring accidents, animal attacks and bacterial infections, we were pretty healthy. These days we live in such artificial environments that it’s hard to even begin to see where we could take advantage of our environment and get in touch again. Immediate visions come to mind of moving into the garden, shivering with cold, foraging for roots and eating the neighbours’ pets while they are warm and cosy inside watching soaps on the TV. Actually, it’s not as hard as that to protect ourselves from the damaging effects of modern life while still taking advantage of it. Have you noticed how much better you feel on holiday? We put it down to less stress, no work, warmth and other obvious factors, but it’s more than that. On a beach we are often barefoot, grounding ourselves to the planet, which is tremendously beneficial. We are also letting our bodies soak up much more vitamin D than we usually get at home, which actually helps us to cope with the usual western diet that is so heavy on sugars and carbs. This is why people notice illnesses clearing up or even vanishing (particularly such things as eczema and psoriasis) even though they are living off alcohol, fries and ice cream. So in the summer, get outside more. Get into the back garden with as few clothes as possible and lie in the sun at midday. Don’t use sunscreen either. We have been educated to be frightened of the sun when it is actually life giving to every organism on this planet. It heals – it doesn’t cause cancer. Avoidance of the sun and sun creams have led to this epidemic of skin cancer via widespread low vitamin D levels among other factors. Recent research actually shows a better prognosis for people with existing melanomas who get out in the sun!! Get into the sun for as long as your skin type allows without burning as often as you can, especially if you’re in northern countries. You need to stockpile that vitamin D as much as you can to tide you over the winter when it’s not available. Back in the early 2000s before I really realised what was going on, my arthritis was definitely already grumbling away in my spine. I used to go out night fishing in all seasons, and even though I ate rubbish such as Pot Noodles, smoked cigarettes (which I seldom did at home) and drank the odd beer, I’d come home with no pain or stiffness, but it would return quickly as soon as that same evening. I never really figured it out at the time, but now I’m pretty sure it was down to being in natural light cycles, seeing the dusk and the dawn, instead of artificial blue lights and TV screens. There are four main areas we need to look at: food, EMFs (electromagnetic fields), temperature and light. Locally produced food is not only good for the reasons previously stated, but if we genuinely eat seasonally, nature will take care of our macronutrient balance too. In summer when we are outside more we can take more carbs. This is why fruits and vegetables grow more in the spring, summer and autumn. In winter, in northern latitudes, very few vegetables grow and almost no fruits… So don’t stuff yourself with them! These days I have no problem totally giving up veg in the winter and eating just fats, meat, fish and eggs in various combinations. It took me a long time to have the confidence to do that, but I am now convinced it’s perfectly safe as long as you buy good grass fed meat and wild caught fish… and if you are diabetic or autoimmune it’s a revelation. Ditch the carbs in the winter, even if you don’t want or need to in the summer. You’ll be surprised! Of course we have only recently had such an enormous amount of WiFi flying around, so the full effects of this haven’t been seen, and the mainstream is very slow to catch up on just how dangerous it is. Okay, this isn’t strictly seasonal in nature, but in the winter we are inside for longer and subjected to more of it every day… and our other increased disconnects with nature make us even more vulnerable to its effects. I won’t go into what to do about it in detail here, but I have written about it in another blog post HERE. Our ancestors weren’t idiots. They didn’t spend all winter freezing in their dwellings – they knew how to build fires and warm themselves, but they certainly felt more of the cold than we do these days with our central heating on full blast from September to April. Of course you should enjoy a warm house, but just let your body feel the cold from time to time when it’s cold outside. Wear one layer less than you usually would when out and about. You’ll soon get used to it. Also, very importantly, give cold showers and baths a go. Start with a cold shower at the end of your warm shower after you’ve washed. See if you can stretch it to five minutes (and more when you get comfortable and adapted). Progress to cold baths when you feel ready. It’s really only the initial shock that’s nasty, and even that can get rather exhilarating when you get used to it. After that, it’s kind of a warm glow. You don’t need to chill your core – once you even get close to shivering, get out! It’s about chilling the skin but staying warm and getting more adapted to the cold. I won’t go into the science, but it resets the body through so many systems – hormonal, immune etc. It kills inflammation as well and really helps with sleep. It is also becoming clear that it has a huge effect on blood sugar metabolism, which makes it ideal for diabetics in conjunction with a ketogenic diet. Another great benefit is that it burns fat very effectively and even turns the “bad fat”, the white adipose tissue, into “good fat”, the brown adipose tissue, which can’t be bad! For more info on this check out Jack Kruse’s Cold Thermogenesis Easy Start Guide HERE. 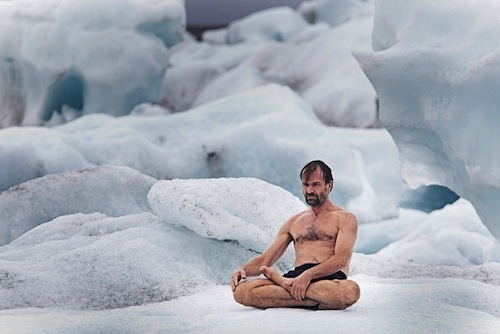 Also for inspiration and to see just how far you can take it and what it can do to your body, research into Wim Hof (aka The Iceman, pictured at the top of this post), who has swum under polar ice and even climbed Everest just dressed in shorts, so a cold bath is really nothing to moan about considering the benefits. A good starting point on Wim’s story and the benefits of cold thermogenesis on the immune system would be this YouTube video HERE. Finally, and probably most importantly, we come to light. Even the mainstream is discovering just how damaging artificial blue light is, especially at night. It seems so subtle that it has gone unnoticed as a cause of disease and insomnia for a long time, but finally we are realising the devastating consequences. It is emerging just how many diseases, especially cancers, are triggered by living and working under artificial light or even staring at screens in bed. Night workers have a far higher rate of cancer than day workers for example, but we are all polluting ourselves by watching TV all evening under LED bulbs, perhaps the worst form of domestic lighting yet invented. We are designed to see some blue light in the mornings, so go outside, get your bare feet on the ground for ten minutes (yes, even in winter) and look at the sun coming up, or even the clouds in that direction. Trigger that cortisol cycle at the correct time of day, telling the body to wake up and spring into action, not at night when it’s time to sleep! Get some good blue blocking glasses AND WEAR THEM IN THE EVENING!! Even better, turn off all lights and screens, light some candles and actually interact with your family… play games, tell stories, make love… let that melatonin cycle kick in and go to bed when you’re tired instead of forcing yourself to stay awake for one more episode of whatever TV series you are binge watching. For more info on better sleep, see my post HERE. It’s really not that hard to make these small changes. I probably knew about a lot of them before most due to my interest in these things, but still I needed a crippling disease to make me sit up and take notice. Don’t wait that long!! I no longer have that crippling disease, and since I started observing these simple guidelines I can’t even remember the last time I had a cold. I’m not immune; I know the bugs get into me, as I have a slight sniffle for half an hour or so in the evening and then wake up fine, forgetting it even happened… only to find everyone else bedridden! At this time of year when everyone starts complaining about being ill, I am very grateful to have discovered all this, because I’m confident I won’t be joining them in the queue for useless antibiotics at the doctor’s office. Nor will I be buying daft UV lamps to cure my SAD, which is completely the wrong way around the problem. If you observe the seasons, stay in synch with them and enjoy them all, you should be just as happy an vibrant in the winter as you are in the summer. Go on… I really urge you to try it. What do you have to lose? I’ll answer that – excess fat, illnesses, depression… and even a slice of your electricity bills! © 2019 Ancestral Health and Awakening (AHA!) All Rights Reserved.